The responsibilities of an Accounts Payable Processor include processing invoices in computer systems. The underlined duties of this job description template are processing check requests and tax payments and ensuring all appropriate approvals have been received, participating in expense tool enhancement, testing, patching etc. The individual is also responsible for auditing transactions related to lodging receipts, airfare etc., importing and processing electronic invoice files and ensuring all payments are made on time and discounts are maximized. 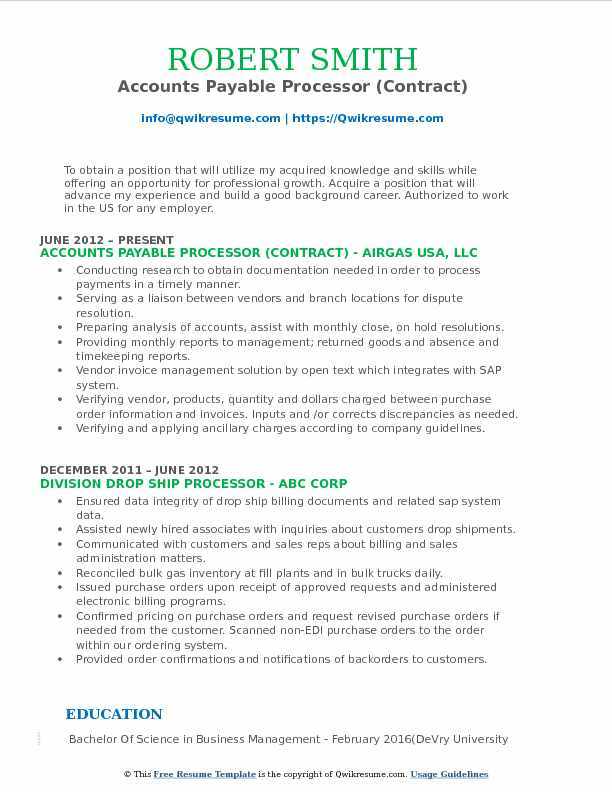 This job requires educational qualification of high school diploma or equivalent, specialization in accounts is a plus. The skill set includes strong verbal skills, must be detail oriented and have the ability to multi-task and possess organizational and time management skills. 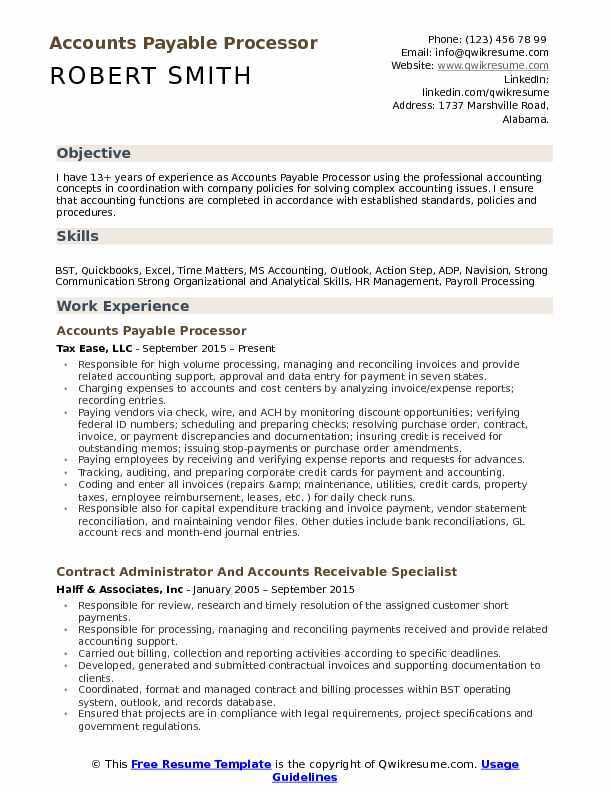 Accounts Payable Processor Resume should portray proficiency in excel, word, outlook and other relevant software. Headline : Exceptional Accounts Payable Processor professional who addresses inquiries and resolves problems as they arise. I have dedicated the last 12 years to my children and family, and am eager to return to the workforce. Entering all invoices into Envi and Oracle programs and running weekly preliminary check runs to determine cash requirements. Making sure all pricing and purchase orders are entered into the system properly. Reconciliation of all vendor statements that come in the mail to verify payment has been made. Closing Oracle at the end of the month and running end of month report for management. Coding and entering invoices that are not going directly into Envi into Oracle. Working closely with the billing coordinator by searching for invoices, pricing and backup. Scheduling patient procedures to ensure efficient and accurate processing of information. Making any changes to the schedule as they arise and confirm changes in the operating room. Scanning all patient charts into the system and save the chart into the system. Auditing 20% of all charts that are scanned into the system to ensuring every page has been scanned. Assisting in finance accounting department operations, by maintaining all accounts payable files. 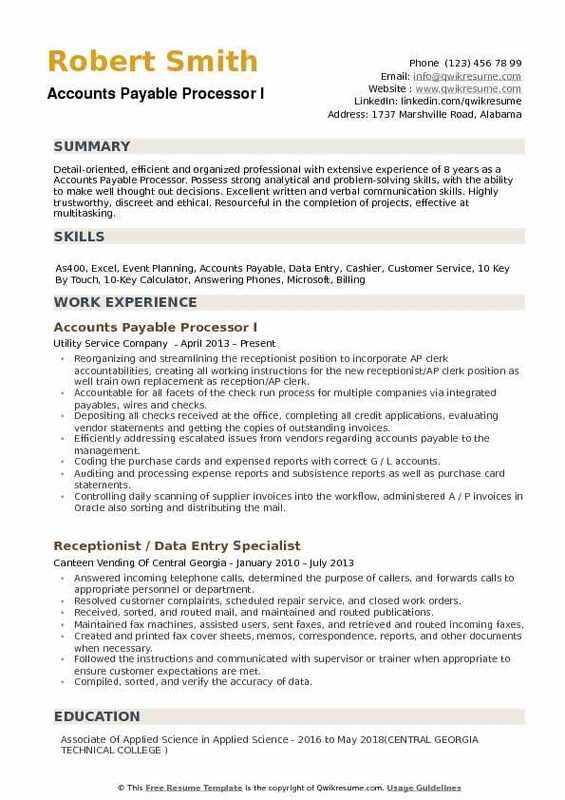 Objective : To secure a position that will enable me to use my strong communication & organizational skills, customer service background and my ability to work well with people. Reviewing invoices and matched to purchase orders while checking for appropriate documentation and approval. Working with vendors and employees to resolve payment, account or statement discrepancies or inquiries. Analyzing processing for possible improvements or issues, proactively identifying and proposing solutions. Assisting with administrative projects assigned by the operations controller. Maintaining contact list and files and oversee electronic mail distribution lists. Providing administrative support to multiple executives and managers within the organization. Prioritizing and manage multiple projects simultaneously, and follow through on issues in a timely manner, keeping staff updated on progress. 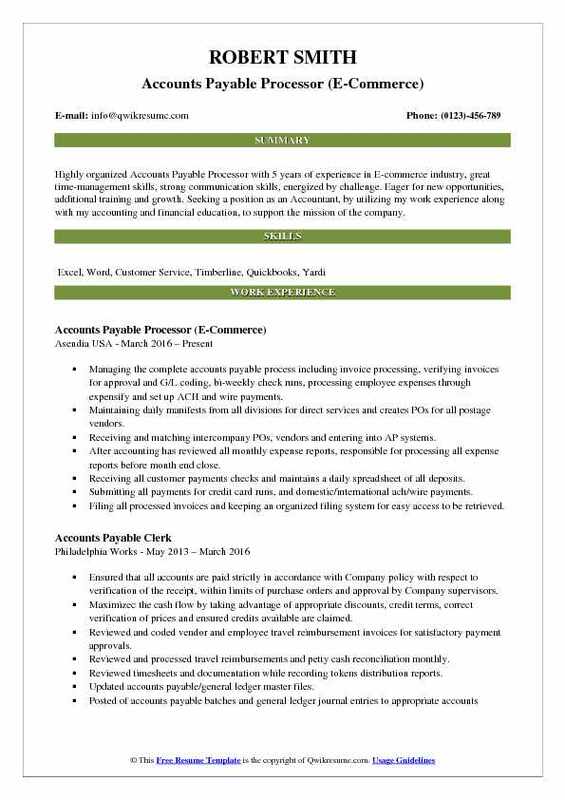 Working as a Temporary accounts payable processor for Philadelphia International Airport. Ensuring the daily functioning of a department or group of employees. Communicating with my boss (operations controller) and conveying the necessary information to the various company parties. Completing administrative work and correspond with other departments. Enforcing company policy to cultivate an environment that makes employees hold one another accountable for their actions. 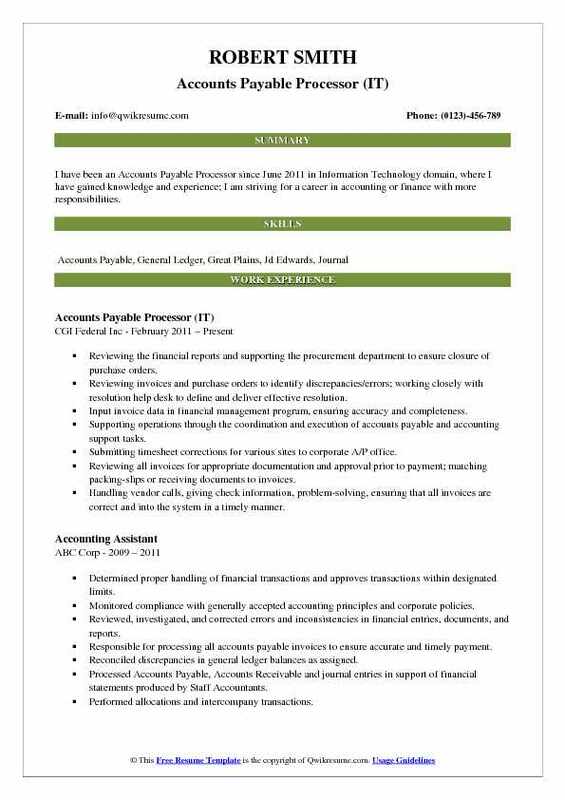 Summary : I have been an Accounts Payable Processor since June 2011 in Information Technology domain, where I have gained knowledge and experience; I am striving for a career in accounting or finance with more responsibilities. Reviewing the financial reports and supporting the procurement department to ensure closure of purchase orders. Reviewing invoices and purchase orders to identify discrepancies/errors; working closely with resolution help desk to define and deliver effective resolution. Input invoice data in financial management program, ensuring accuracy and completeness. Supporting operations through the coordination and execution of accounts payable and accounting support tasks. Submitting timesheet corrections for various sites to corporate A/P office. Reviewing all invoices for appropriate documentation and approval prior to payment; matching packing-slips or receiving documents to invoices. Handling vendor calls, giving check information, problem-solving, ensuring that all invoices are correct and into the system in a timely manner. Resolving purchase order issues related to invoices by working closely with procurement team. Objective : To utilize my education and 2 years of experience in the atmosphere that encourages personal growth and advancement with a focus in finance and accounting. Monitored accounts payable mailbox daily and respond to requests in a timely manner. Reviewed invoices and statements for accuracy and obtain appropriate coding and approvals. Assisted management by providing weekly aging reports and invoice counts. Processed invoice payments quickly and accurately, prioritizing discount and urgent requests. Communicated with suppliers, providers, and suppliers to improve processing efficiency. Met monthly, quarterly, and yearly processing deadlines for book closing purposes. Used GAAP procedures with emphasis on following Sarbanes Oxley act controls. Setup suppliers and providers as payees using w-9 and payment information received. Ensured tax costs are allocated properly for posting to the general ledger. Assigned tasks, assist teammates, and manage time effectively to maximize speed and accuracy. 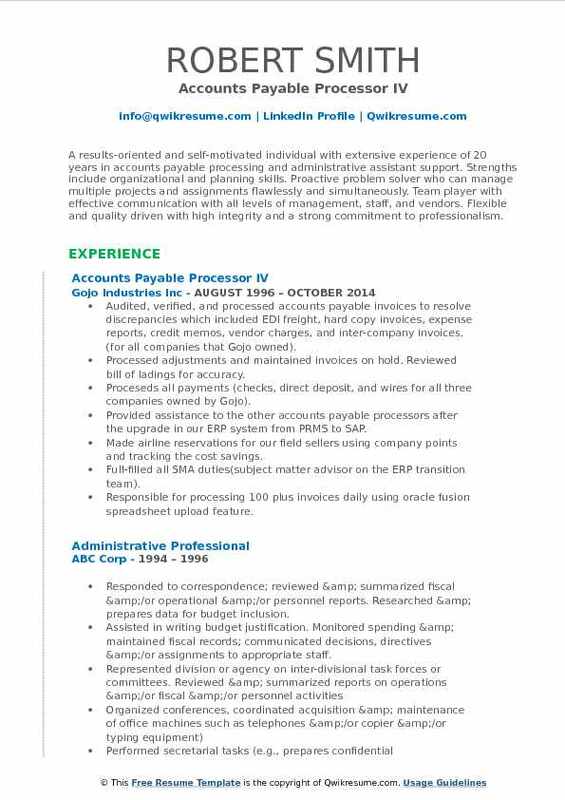 Summary : Over 12 years experience as a Accounts Payable Processor. Possessing a variety of skills to actively contribute to the success of multiple departments. Organized professional focused on accuracy and providing excellent customer service to internal and external customers. Consistently successful in ensuring deadlines are met on multiple platforms in multiple departments. Skills : Data Analysis, Data Sources., Finance, Invoice, Invoices, Excel, Mac, Microsoft Office, MS OFFICE, QuickBooks. Prepared and made deposits for all 16 properties every month or whenever controller or CFO needed special deposits to the bank every month. Assisted accounting manager with ap reconciliation i. e., month end, quarter end, year-end 1099 processing. Reconciled vendor invoices sent to corporate from the property managers on a weekly basis prior to payment being made i. e. , review coding and approvals were accounted for before payments were made. Managed vendor/supplier/internal customer relations; and oversaw the timely, accurate processing of invoices, purchase orders, expense reports, credit memos and payment transactions. Point of contact for all vendor/internal customer relations pertaining to issues etc. Created spreadsheets on monthly utility bills for all properties. Responsible for reporting of any budget irregularities. Responsible for processing monthly payments for all corporate accounts to include utilities. Ensured accurate and compliant a/p files and records in accordance with company policies and government regulations. Provided assistance on projects as needed to controller and accounting manager. Summary : Accounts Payable Processor with 7 plus years of experience in Construction domain is seeking to obtain a meaningful and challenging position that will allow me to exhibit my current skills as well as learn new skills to take into future endeavors. Responsible for processing invoices received, work orders and purchase orders using the Yardi system. 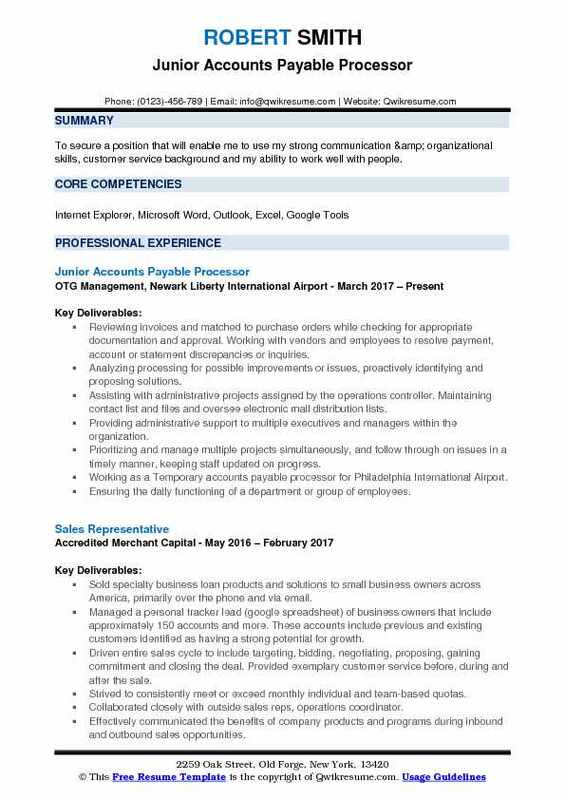 Responsible for researching invoice payments, reconciling vendor accounts, and communicating with vendors and internal employees in a timely manner. Processes invoices received (IR), work orders (WO) and purchase orders (PO) for multiples properties in multiple states for work performed in utilities, construction or miscellaneous corporate expenses by the way of electronic databases. Reviewing and researching reasons for aging account balances and informs AP management of findings. Addressing research items assigned Yardi or identifying and forwarding research item to the appropriate party. Processing all invoice entries for month end, quarter end and annual close accurately and in a timely manner. Assisting with other related clerical duties such as photocopying, scanning, faxing and collating as needed. Providing support to all departments for internal and external audit requests; completing all requests in a timely manner. Promoting an environment that is customer service focused on maintaining positive relationships with internal departments and customers. Generate accounts payable reports and maintain spreadsheets relating to coding, pricing, and accruals. Answer vendor inquiries and assist with the monthly closing process. Headline : To obtain a position that will utilize my acquired knowledge and skills while offering an opportunity for professional growth. Acquire a position that will advance my experience and build a good background career. Authorized to work in the US for any employer. Conducting research to obtain documentation needed in order to process payments in a timely manner. Serving as a liaison between vendors and branch locations for dispute resolution. Preparing analysis of accounts, assist with monthly close, on hold resolutions. Providing monthly reports to management; returned goods and absence and timekeeping reports. Vendor invoice management solution by open text which integrates with SAP system. Verifying vendor, products, quantity and dollars charged between purchase order information and invoices. Inputs and /or corrects discrepancies as needed. Verifying and applying ancillary charges according to company guidelines. Paying employee by receiving and verifying expense reports and request for advances: preparing checks request. Printing and obtaining signatures on all accounts payable checks; facilitateing weekly check runs. Headline : A well organized, dedicated, dependable, results-oriented professional that takes pride in work. 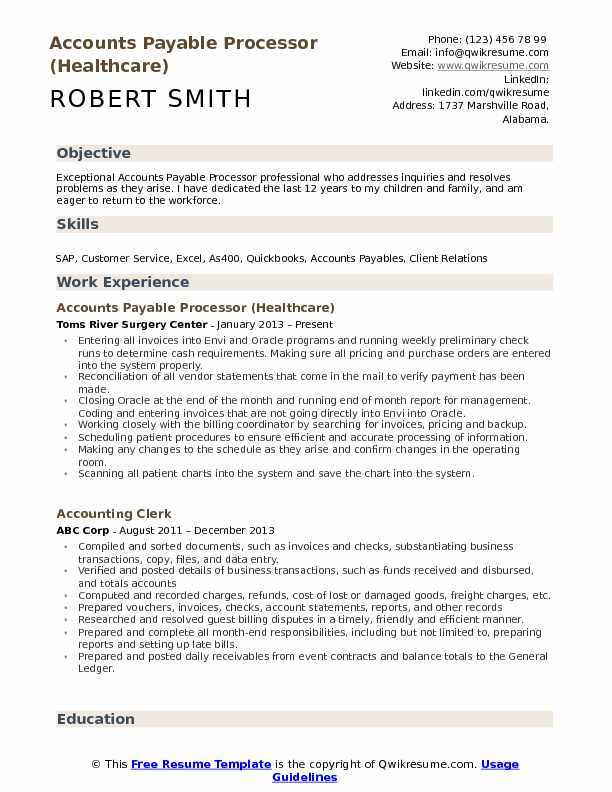 Having 10 years of Accounts Payable experience in the Restaurant and Health Industries. 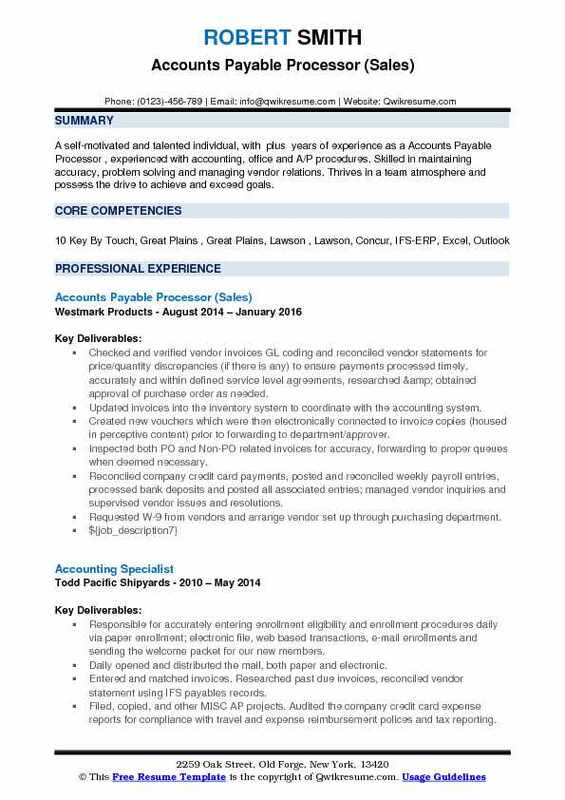 My skills and experiences include: Accounts payable, keying invoices and communicating to vendors. Troubleshooting simple as well as complex issues for internal employees & vendors. Creating, editing, and maintaining employee accounts on concur travel & expense system. Processing over 100 invoices daily using SAP transactions ME23N, MIR0, MIR4 and FB60. Developing and maintaining training manuals on SAP, ODC, and IOL for self as well as new hires. Creating, editing, and deleting recurring payment entries upon request using SAP transactions. Performing payment block release upon request and reviewing using SAP transaction MRBR. Uploading AP documents from Excel to Sap using transaction ZFIU and reviewing for errors using SM35. Involving with preliminary testing for implementation of new accounting software called Readsoft. Maintaining all accounts payables reports, spreadsheets, and corporate accounts payable files. 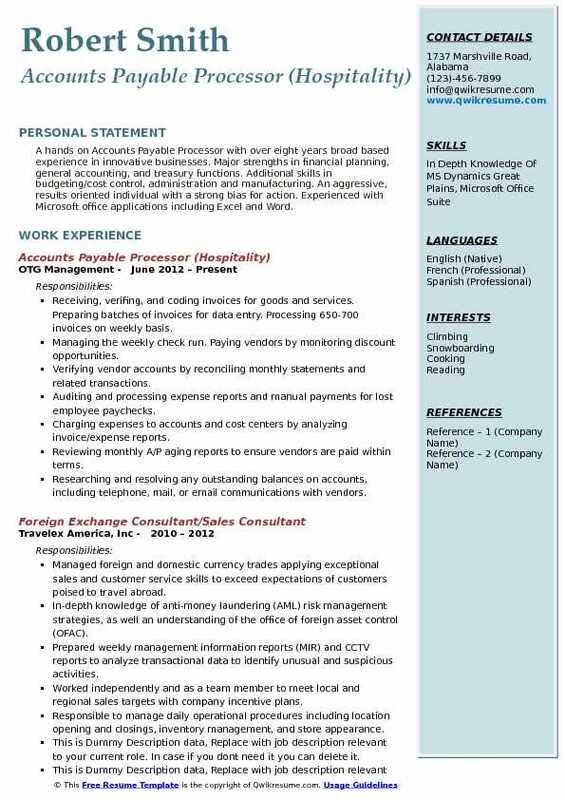 Summary : Highly motivated, top performing Accounts Payable Processor with 15 years of experience is seeking to combine an advanced academic background and hands-on experience to expand my knowledge in the accounting field. Handled AP functions for all cement plants, ready-mix divisions and shipping terminals with regard to posting of PO and Non-PO invoices into SAP. Worked with IXOS program for scanning and prepping of invoices to ensure proper routing for approvals. Trained other employees on PO posting as well as monitor and approve error corrections. Performed wire report and insured all transfers are submitted to the treasury with all necessary back up in a timely manner. Monitored exception list for items not being picked up by check run and provide resolutions where applicable. Handled vendor inquiries, resolution of discrepancies and credit reimbursements. Provided all aspects of department coverage for freight runs, boats, stock transfers. Verified vendor accounts by reconciling monthly statements and related transactions. Maintained accounting ledgers by verifying and posting account transactions. 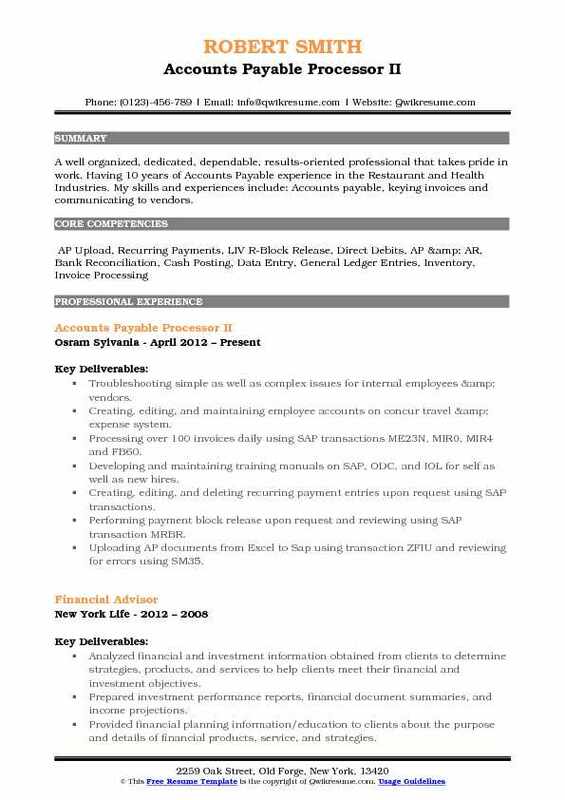 Summary : Detail-oriented, efficient and organized professional with extensive experience of 8 years as a Accounts Payable Processor. Possess strong analytical and problem-solving skills, with the ability to make well thought out decisions. Excellent written and verbal communication skills. Highly trustworthy, discreet and ethical. Resourceful in the completion of projects, effective at multitasking. Reorganizing and streamlining the receptionist position to incorporate AP clerk accountabilities, creating all working instructions for the new receptionist/AP clerk position as well train own replacement as reception/AP clerk. Accountable for all facets of the check run process for multiple companies via integrated payables, wires and checks. Depositing all checks received at the office, completing all credit applications, evaluating vendor statements and getting the copies of outstanding invoices. Efficiently addressing escalated issues from vendors regarding accounts payable to the management. Coding the purchase cards and expensed reports with correct G / L accounts. Auditing and processing expense reports and subsistence reports as well as purchase card statements. Controlling daily scanning of supplier invoices into the workflow, administered A / P invoices in Oracle also sorting and distributing the mail. Effectively dealing with manual checks, responding to telephone, supervising outgoing mail and aiding other departments as required. 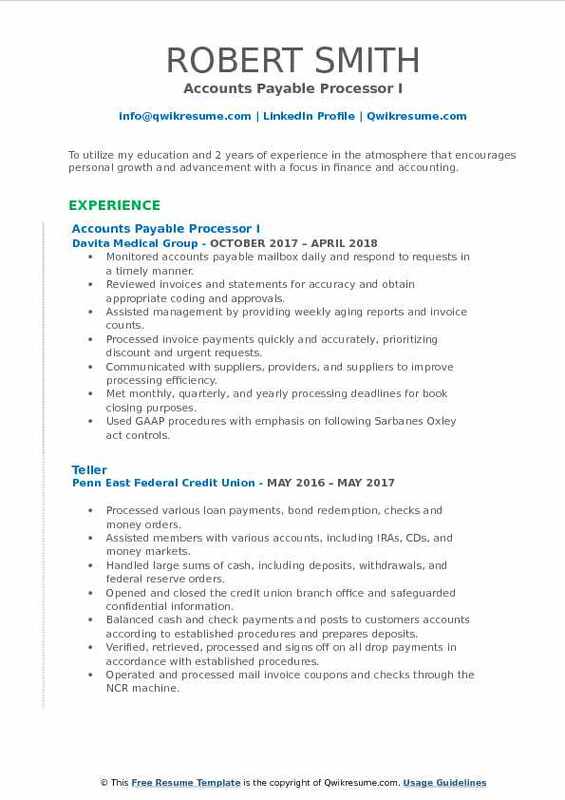 Summary : I have 13+ years of experience as Accounts Payable Processor using the professional accounting concepts in coordination with company policies for solving complex accounting issues. I ensure that accounting functions are completed in accordance with established standards, policies and procedures. Responsible for high volume processing, managing and reconciling invoices and provide related accounting support, approval and data entry for payment in seven states. Charging expenses to accounts and cost centers by analyzing invoice/expense reports; recording entries. Paying vendors via check, wire, and ACH by monitoring discount opportunities; verifying federal ID numbers; scheduling and preparing checks; resolving purchase order, contract, invoice, or payment discrepancies and documentation; insuring credit is received for outstanding memos; issuing stop-payments or purchase order amendments. Paying employees by receiving and verifying expense reports and requests for advances. Tracking, auditing, and preparing corporate credit cards for payment and accounting. Coding and enter all invoices (repairs & maintenance, utilities, credit cards, property taxes, employee reimbursement, leases, etc. ) for daily check runs. Responsible also for capital expenditure tracking and invoice payment, vendor statement reconciliation, and maintaining vendor files. Other duties include bank reconciliations, GL account recs and month-end journal entries. Gathering all invoices (from a-z) with documentation before the check run and distribute checks printed to the assigned individuals to match the checks with invoices and documentation. 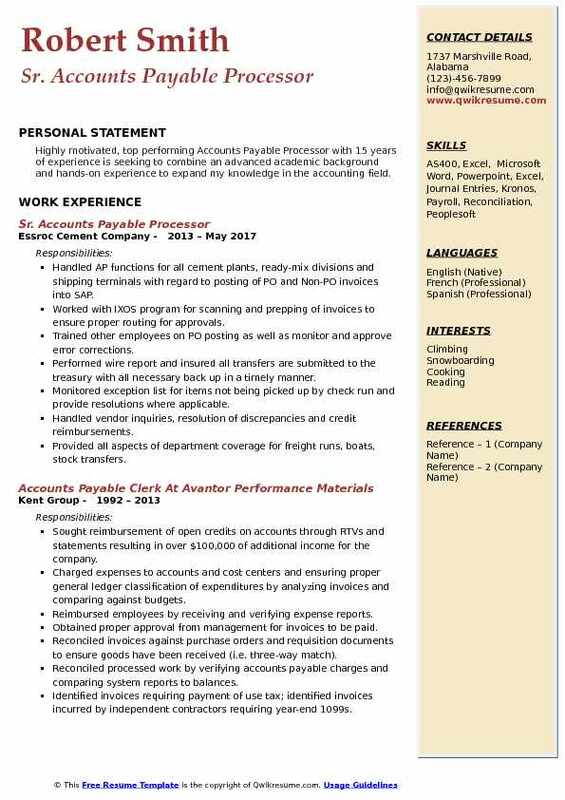 Headline : A self-motivated and talented individual, with plus years of experience as a Accounts Payable Processor , experienced with accounting, office and A/P procedures. Skilled in maintaining accuracy, problem solving and managing vendor relations. Thrives in a team atmosphere and possess the drive to achieve and exceed goals. Checked and verified vendor invoices GL coding and reconciled vendor statements for price/quantity discrepancies (if there is any) to ensure payments processed timely, accurately and within defined service level agreements, researched & obtained approval of purchase order as needed. Updated invoices into the inventory system to coordinate with the accounting system. Created new vouchers which were then electronically connected to invoice copies (housed in perceptive content) prior to forwarding to department/approver. Inspected both PO and Non-PO related invoices for accuracy, forwarding to proper queues when deemed necessary. Reconciled company credit card payments, posted and reconciled weekly payroll entries, processed bank deposits and posted all associated entries; managed vendor inquiries and supervised vendor issues and resolutions. Requested W-9 from vendors and arrange vendor set up through purchasing department. 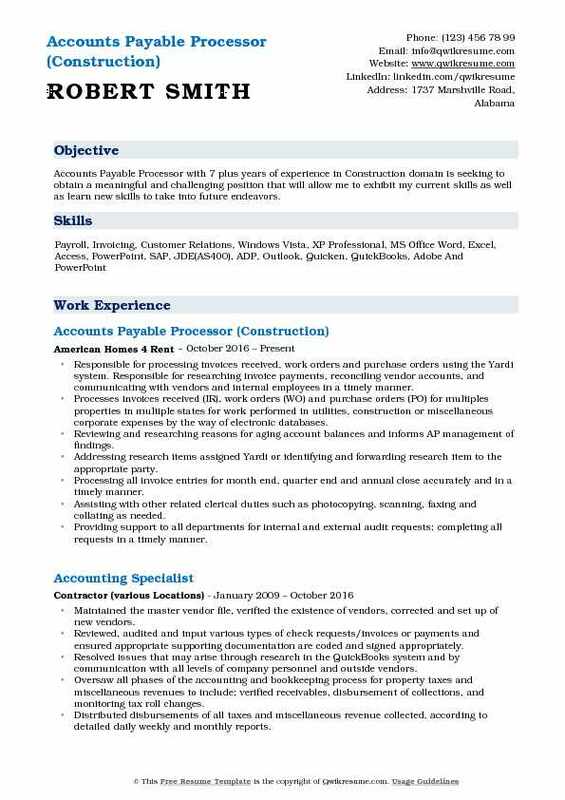 Headline : Highly organized Accounts Payable Processor with 5 years of experience in E-commerce industry, great time-management skills, strong communication skills, energized by challenge. Eager for new opportunities, additional training and growth. 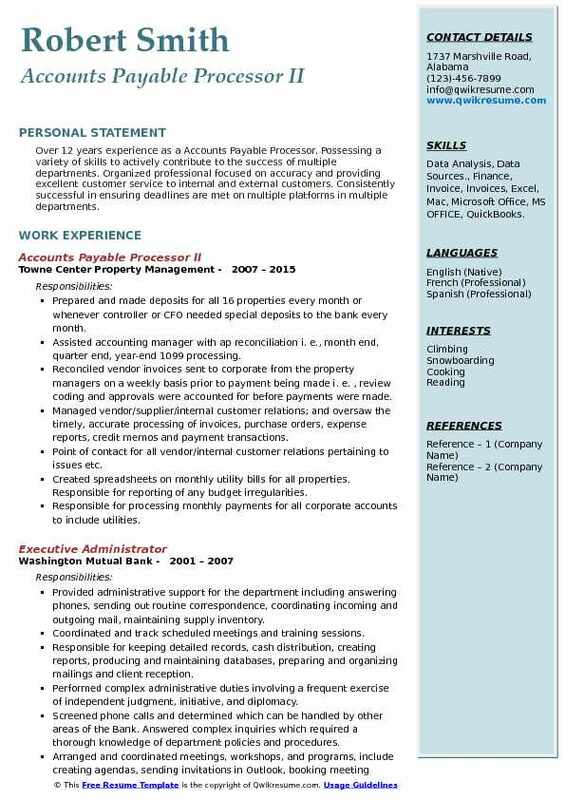 Seeking a position as an Accountant, by utilizing my work experience along with my accounting and financial education, to support the mission of the company. Managing the complete accounts payable process including invoice processing, verifying invoices for approval and G/L coding, bi-weekly check runs, processing employee expenses through expensify and set up ACH and wire payments. Maintaining daily manifests from all divisions for direct services and creates POs for all postage vendors. Receiving and matching intercompany POs, vendors and entering into AP systems. After accounting has reviewed all monthly expense reports, responsible for processing all expense reports before month end close. Receiving all customer payments checks and maintains a daily spreadsheet of all deposits. Submitting all payments for credit card runs, and domestic/international ach/wire payments. Filing all processed invoices and keeping an organized filing system for easy access to be retrieved. Performing month-end accounting reconciliations according to the schedule. Creating new suppliers, remit to addresses and payment terms updates in conjunction with supply master team. Summary : A results-oriented and self-motivated individual with extensive experience of 20 years in accounts payable processing and administrative assistant support. Strengths include organizational and planning skills. Proactive problem solver who can manage multiple projects and assignments flawlessly and simultaneously. Team player with effective communication with all levels of management, staff, and vendors. Flexible and quality driven with high integrity and a strong commitment to professionalism. Audited, verified, and processed accounts payable invoices to resolve discrepancies which included: EDI freight, hard copy invoices, expense reports, credit memos, vendor charges, and inter-company invoices. (for all companies that Gojo owned). Processed adjustments and maintained invoices on hold. Reviewed bill of ladings for accuracy. Proceseds all payments (checks, direct deposit, and wires for all three companies owned by Gojo). Provided assistance to the other accounts payable processors after the upgrade in our ERP system from PRMS to SAP. Made airline reservations for our field sellers using company points and tracking the cost savings. Full-filled all SMA duties(subject matter advisor on the ERP transition team). Responsible for processing 100 plus invoices daily using oracle fusion spreadsheet upload feature. Managed A/P email inbox, fielding questions from field, international agents, domestic and foreign suppliers. Summary : A hands on Accounts Payable Processor with over eight years broad based experience in innovative businesses. Major strengths in financial planning, general accounting, and treasury functions. Additional skills in budgeting/cost control, administration and manufacturing. An aggressive, results oriented individual with a strong bias for action. Experienced with Microsoft office applications including Excel and Word. Receiving, verifing, and coding invoices for goods and services. Preparing batches of invoices for data entry. Processing 650-700 invoices on weekly basis. Managing the weekly check run. Paying vendors by monitoring discount opportunities. Auditing and processing expense reports and manual payments for lost employee paychecks. Charging expenses to accounts and cost centers by analyzing invoice/expense reports. Reviewing monthly A/P aging reports to ensure vendors are paid within terms. Researching and resolving any outstanding balances on accounts, including telephone, mail, or email communications with vendors.